Carry and protect your DSLR with attached lens, 1-2 extra lenses, and a flash in this black Incase Designs Corp DSLR Sling Pack, which also accommodates an iPad/tablet or 11" MacBook Air laptop. Its design enables you to swing it around from your back to the front of your body with ease, so you can access your camera and gear quickly without removing the pack. Adjustable interior dividers enable customization, while multiple internal pockets and an external zip pocket with organizer provide plenty of room for accessories. For added comfort, the pack offers a breathable mesh back panel. Additionally, straps allow for the attachment of a tripod or monopod. The Sling Pack is carried by the padded, adjustable shoulder strap or the convenient carry handle. It's crafted from durable heathered nylon, which features interwoven yarns made from different types of fibers with subtle variations in color. Holds DSLR with attached lens, plus 1-2 extra lenses and a flash. Accommodates an iPad, another tablet of similar size, an 11" MacBook Air, or a laptop of comparable size in a padded compartment. Sling design enables you to swing it around from your back to the front of your body with ease, so you can access your camera and gear quickly without removing the pack. Adjustable interior dividers for camera and lens compartments enable customization. Multiple internal pockets and an external zip pocket with organizer provide plenty of room for accessories. The external pocket also has a slip pocket for an iPhone or another smartphone with a similar form factor. Ample padding with a soft fleece lining provides protection for your valuable gear. Padded, ergonomic shoulder strap with adjustable quick-release buckle. Carry handle provides an alternate transport option. Mesh back panel for breathability and comfort. Crafted from durable heathered fabric, which features interwoven yarns made from different types of fibers with subtle variations in color. 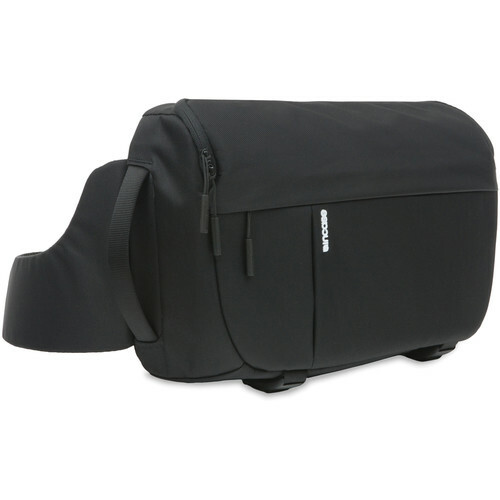 Box Dimensions (LxWxH) 17.5 x 9.7 x 7.4"
DSLR Sling Pack (Black) is rated 4.2 out of 5 by 13. Rated 4 out of 5 by Anonymous from Nice Sling - Fits Surface Pro 4 (With Case if Modified) Overall a very nice sling, but I'm writing this review solely to address the tablet pocket's capacity since it was unclear to me prior to purchase. I wanted to carry a Surface Pro 4 in a Kensington case with the type cover, which at its widest points measures 12.375 wide, 8.5 high, and 0.9375 thick. If the bag is left as it is when shipped, the Surface Pro 4 in this case would not fit in the padded compartment due to an elastic strip at one end of the compartment's zipper, and stitching + a layer of cloth at the other end of the compartment's zipper. I removed the elastic and made a small cut in the fabric at the other end of the zipper to let the zipper have the full range of movement. To show how minor and inconspicuous the cut is, I've attached a photo of the zipper as modified. Once modified it will fit the Surface Pro 4 in the case with the dimensions described above, but the zipper on the internal tablet pocket is difficult to close. Because of the dimensions of the bag overall its not a big deal to not be able to zip this inner pocket unless you have loose items in the bag that you would be worried about coming in contact with the tablet. The modified pocket easily fits the Surface Pro 4 without a case and zips closed without a problem, and you could just barely fit it without modifying the pocket, but it is a stretch to get through the smaller unmodified zipper opening. Rated 3 out of 5 by tesilab from Near perfect except for terrible zipper This is a very nicely designed sling pack. I returned a ThinkTank Turnstyle 20 in favor of this one, due to (for me) its more useful design, but that is despite a really flimsy finicky zipper which inspires no confidence as to its longevity. Easily the worst zipper of all the sling bags I tried personally at B&H. The reason I preferred this bag mainly because it has a very clean design, and especially since it is easy to access the bottom compartment of the bag first, if I like. This was important to me, since I want to simply rotate the bag and pull out a camera, and reach-wise, that is most easily accomplished from the bottom of the bag. I could not do this with a ThinkTank Turnstyle 20, so I returned it. There is a fancier version of this bag with nicer materials, but also with a much fussier design (two separate pads for the shoulder, and a bizarre airline-like buckle). I would have hoped you could buy a better zipper with the extra money, but its the same. Rated 4 out of 5 by QuentinL from Close! Sling bag provides easy access and can accommodate large sizes. Small nitpick on the zippers - could be easier to use and zip. Internal dividers are padded and solid, have flaps that allow internal separation. Roomy and spacious for sony mirrorless body and 2-3 lenses along with accessories. If you have this in the summer, can overheat - but that's with any bag. Looks good, easy to use, would be 5 stars if it was more water resistant and the zippers were easier to use. Rated 5 out of 5 by Anonymous from Well designed, quality, great price I purchased this bag because I wanted to carry my 7D Mark II with a few lenses but didn't want to use a bag that screamed Camera Bag. This bag easily fits a body and 3 average size lenses along with batteries, cards, cables, etc. I wish my 15 Macbook Pro would fit but the bag would have to increase in size for that to happen and I think the bag is currently a great size. I thought I would be wearing it quite a bit but I found it to be just a bit uncomfortable due to the size of the sling strap. I like that there are two small handles that allow you to carry the bag in either a vertical or horizontal orientation. One awesome surprise, the handle is wide enough to slide over my luggage roller handle so it's one less thing to carry or wear when traveling. Overall, it's a quality well designed bag at a great price. Rated 4 out of 5 by Barry from Lightweight and easy to use. I can really get a a lot into this case. D800 2 lenses, filters and various other small items. Made to worn over the left shoulder it easily swing around to the front for access. Has adjustable dividers and a small outside pocket. Does not have a rain cover. The zipper is not as heavy duty as you will find on more expensive bags. Can't beat it for the price. For me the weight is what sells this. Rated 5 out of 5 by Anonymous from Travel Bag I'd recommend this as a travel bag. Fits my compact DSLR camera perfectly, along w/ two full size telephoto zoom lenses, batteries, charger, etc. I was looking for a sling bag that wasn't a full size backpack. This works perfectly, it's compact, super comfortable (can't even feel it on my back), and looks great. Rated 5 out of 5 by Anonymous from Great Camera sling! This Camera sling is extraordinarily comfortable and holds my Nikon D 610 with a couple lenses, iPad, and other random items with space to spare! It was a good investment and I highly recommend this bag to anyone who wants a light camera bag for short day trips! does this work as a waist pack as well? Or just a sling pack? No it's not Waterproof (look at hard pelican cases). I wouldn't take this bag whitewater rafting. It's a great bag. it will keep the contents dry in medium rain but it's not designed for submersion or prolonged water exposure. I've seen some bags with rain guards built into them but this bag doesn't have that feature. Does this fit a Macbook pro 13 in retina display? Will the inside dimensions of this bag fit a Nikon D7200+grip with attached 70-200 lens? Inside needs to accommodate at least 12.5 inches due to teleconverter. That'd be pretty snug as your camera would have to sit sideways and probably wouldn't be the best cushion. If you detach the lens, you'd be set.